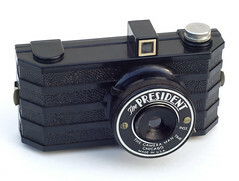 Those who appreciate and collect vintage bakelite cameras frequently make two curious discoveries: First, a surprising number of simple plastic cameras seem to have originated from Chicago, Illinois, USA. And second, when compared closely, a number of these models (ostensibly coming from different manufacturers) have body styles which look practically identical. In fact, several of these brand names can be linked directly to one particular address: 711–715 West Lake St., Chicago, as noted in period advertisements or the manuals included with cameras. But even where the address is unknown, it seems quite clear that many of the Chicago camera models emerged from exactly the same set of molds, casting doubt on the supposed separate identities of their makers. 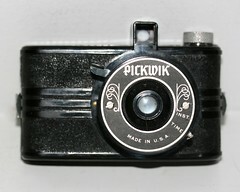 Camera-wiki.org has listed several of these "companies" on their own pages. But this article is an effort to consolidate this bewildering swarm of brand and model names into a single page: and to cross-reference body styles with alleged company names, using examples that have been observed on Flickr, eBay and elsewhere. 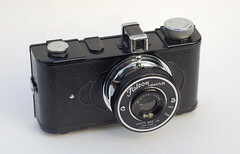 In all cases, these are simple "snapshot" cameras, with the greatest variety being the many models for 127 film in the eye-level "minicam" style which pays homage to the successful 35mm Argus A. Many questions still require further research, but a few facts seem clear. 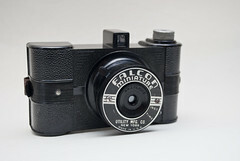 Utility Manufacturing Co. originated several bakelite camera models under its brand Falcon in the 1930s. Utility gave its address as 40 West 25th St., New York City. 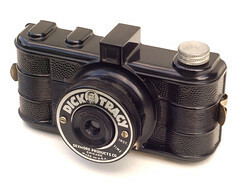 But certain camera models that were unquestionably made by Utility also appeared under other "company" names, the start of a practice that would explode in later years. Already in 1940, cameras were being sold from 711 W. Lake Street, Chicago by Monarck/Monarch (choose your spelling; the company used both). Many Monarch models have also been observed branded with names of other "manufacturers." Furthermore, by around 1946, Falcon models were reappearing branded as Spartus—or, if even still under the Utility/Falcon name, now marked as made in Chicago—with the Spartus home address given as 711 (or 715) W. Lake Street. Confusingly, some early advertisements give Spencer as the company name behind Spartus brand cameras. Spartus Corp. was a successful Chicago manufacturer of clocks and razors. It was owned by Jack Galter, onetime jazz drummer and serial entrepreneur. 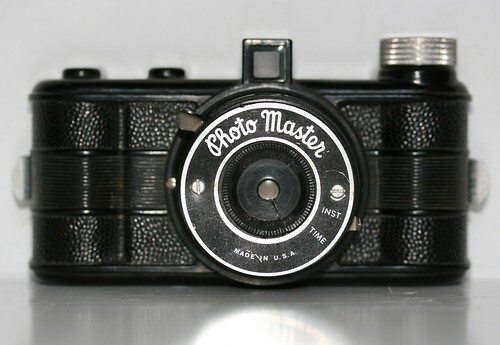 Beginning around 1939 he obtained several camera-related patents: One design patent is unmistakably that seen on numerous Chicago minicams (such as the Photo Master illustrated at right). The camera illustrated in another patent looks strikingly like the Monarck 127-film pseudo TLRs, while another is certainly the Falcon Rocket. A Galter Products Co. also operated from 715 W. Lake St.—including clocks and cameras in its offerings. In later years, Jack Galter accumulated significant real estate holdings, and became a major Chicago-area philanthropist. At some time in the early 1950s, Spartus was sold to Harold Rubin, who gave it the name Herold Products Company, Inc., but continued using the Spartus brand on clocks and cameras. 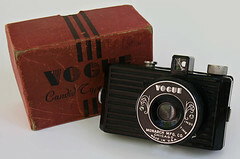 And to tie this all into an impossible tangle, there is at least one printed manual for the Spartus Full-Vue which shows "Herold Manufacturing Co., not Incorporated" as the company, 715 W. Lake as the address, whose cover shows a camera which is plainly labeled Galter Products under its taking lens. In the mid-1950s Herold Products listed a different address, 2110 W. Walnut, Chicago. 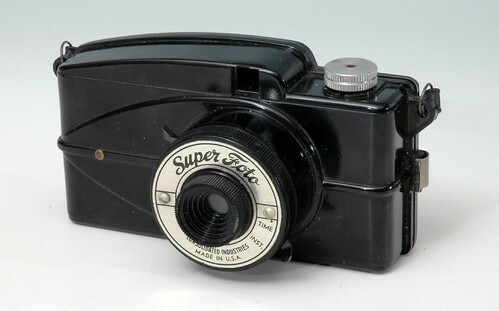 And some of its later models are designs unique to them, ones which do not appear under other brands (for example the Spartus Co-Flash). By the 1960s Herold Products had reverted to Spartus as the company name, and it continued its clock production for many years (with later models showing Louisville, Mississippi as the company address). It cannot be conclusively shown that all the camera brands listed here are products of the Falcon/Spartus/Herold group. Metropolitan Industries seems to have the most probable claim of true independent existence, with several unique models. But even they have suggestive overlaps with the Galter/Spartus brands (e.g. 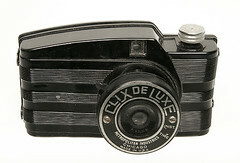 the "Cinex" name and the Clix De Luxe body style). 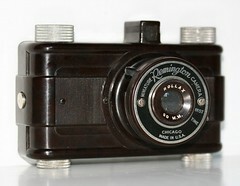 The appearance of the Chicago cameras under a plethora of different names was facilitated by printing all the camera's identifying branding onto a single circular "donut" plate which was held to the front of the lens barrel by two screws. 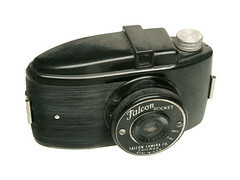 It is possible that the circular lens-shutter assemblies seen on so many of these cameras (with an instant/time selector at approximately the 4 o'clock position) were themselves provided by another subcontractor, and simply "bolted on" to molded bodies from different shops. The motivations for creating so many quasi-fictional brands can only be guessed at. Perhaps it was to offer certain distributors a brand that was exclusively theirs. Perhaps it was to avoid negative word-of-mouth over what were, after all, very basic cameras with rudimentary optics. In any case, the same approach would one day be adopted by Hong Kong's manufacturers of cheapie cameras, giving us the many names of the Diana or the Bedfordflex. 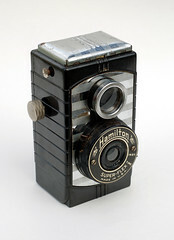 Many of the cameras here are designed to use 127 film, but in "half frames." 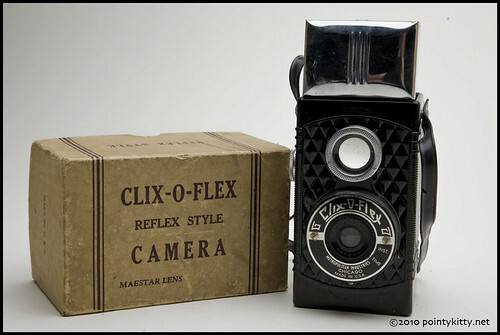 This was an economy measure first seen in depression-era cameras. The backing paper of 127 film has rows of frame numbers printed onto it; these align with red frame-counting windows on the back of the camera. But rather than exposing eight standard frames per roll, many of the "minicams" here would split each frame in half: Every frame number would be advanced first to one, then to the other red window. This yielded 16 exposures per roll (although it made the orientation of the rectangular frame vertical rather than horizontal). The resulting frame size is roughly 3×4 cm. These groupings are based on the designs of body moldings: i.e. the decorative ribbing and other motifs; the film compartment locations, etc. These groups may be further subdivided according to variations of viewfinders, knobs, flash sync attachments, lenses, plastic colors, etc. Remington (Deluxe Prods.) 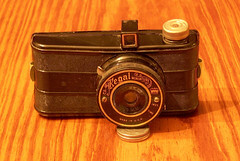 Illustrated camera may be 127 "full frame"
To be included here, a company must have offered at least one model that also appeared under a completely different "company" name. Most of the names in this list seem to have been pure marketing fictions. It is possible a few real, independent manufacturers have been inadvertently included here. Wittie Mfg. & Sales Co.
↑ A May 1940 advertisement from Popular Photography (Vol. 6, No. 5; page 57) shows this address. ↑ This June 1940 advertisement for Monarck gives 711 W. Lake Street as the company address (Popular Photography magazine, Vol. 6, No. 6; page 107). It must be noted that the "Flexmaster" looks suspiciously like the Falcon Flex and the "Lincoln" like a Falcon Miniature. ↑ For example, a Chicago retailer's ad from November 1946 shows the Spartus 35. Popular Photography (Vo. 19, No. 5) page 31. 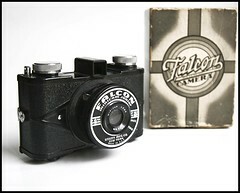 ↑ For example, here is a Falcon minicam branded "Utility Mfg. Co., Chicago U.S.A.," from Wayne Violette on Flickr. ↑ In this 1947 ad for Spartus cameras, note "The Spencer Company" at 715 West Lake Street is shown as the company name at the bottom of the page. ↑ 6.0 6.1 US design patent 114,324 from freepatentsonline.com. ↑ 7.0 7.1 U.S. Patent 2,220,599 from freepatentsonline.com. ↑ 8.0 8.1 U.S. Patent 2,196,604 from freepatentsonline.com. ↑ 9.0 9.1 An advertisement from December 1955 promotes the Spartus Full-Vue camera, a Spartus clock, and an electric razor (Life magazine Dec 12, 1955; Vol. 39, No. 24; page 56). The address given for Herold Products is 2110 W. Walnut St, Chicago, which is a couple of miles west of 711–715 W Lake St.
↑ However, see the wiki articles Remington and President for typical clues that several allegedly-separate companies were at the very least using a common pool of parts. ↑ Max Levinger ad for Champion minicam in Popular Photography magazine April 1946 (Vol. 18, No. 4) page 174. ↑ 14.0 14.1 Bernard Products Co. was a real company. However the Faultless Miniature resembles other Chicago pseudo TLRs (e.g. the Monarch Royal Reflex) but turned 90° and omitting the brilliant finder. ↑ Acro Scientific Products Company was located at 1414 South Wabash in Chicago. 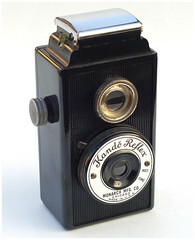 In 1940 they offered the Acro Model R, which was a fairly sophisticated rangefinder camera. It is possible that the "minicam" Acro is a coincidental (or deliberate) reuse of the name by unrelated parties (however, the Model R has the same flat back as the Acro, and the viewfinder Acro Model V is intermediate between the two).